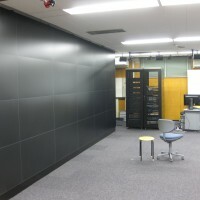 Please see "Large-Scale Visualization System WEB" about how to use this system. 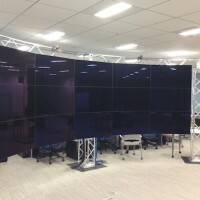 15-screen Cylindrical Stereo Visualization System is a visualization system composed of 15 46-inch WXGA (1366x768) LCD, and Image-Processing PC Cluster driving visualization processing on 15 screens. A notable characteristic of this visualization system is that it enables approximately 16-million-pixel very high-definition stereo display. Also, it is notable that large-scale and interactive visualization processing becomes possible through the dedicated use of PC cluster for large-scale visualization (VCC). Furthermore, OptiTrackFlex13, a motion capturing system has been introduced in this visualization system. By making use of the software corresponding to the motion capturing system, interactive visualization leveraging Virtual Reality (VR) becomes possible. Furthermore, high definition video-conference system (Panasonic KX-VC600) is available. Image Processing PC Cluster on Umemkita (IPC-U) is composed of 6 computing nodes, each of which has two Intel Xeon E5-2640 2.5GHz processors, a 64 GB main memory, 2 TB hard disk (RAID 1), and NVIDIA Quadro K5000. This PC cluster controls visualization processing on 15 screens. IPC-U has Windows 7 Professional and Cent OS 6.4 dual-installed as operating system. Users can select either of operating systems according to their purposes. The following software are installed on IPC-U. General-purpose visualization software. Available for VR display such as CAVE.